It’s a Steam Train – Get Over it! course, the game itself. People responded quite strongly. ‘A train in Zelda? What is the world coming to?’ People really need to realize that the train of Spirit Tracks isn’t anything to warrant such a response. It fits into the overall picture just fine. Spirit Tracks, at the moment, has a timeline placement of 100 years after Phantom Hourglass. Phantom Hourglass, you know, the game that has the S.S. Linebeck. A steamboat. Hence the S.S. prefix. And what do we see in Spirit Tracks? side in their invention and progression throughout the 18th Century. and trains that you have the problem with. 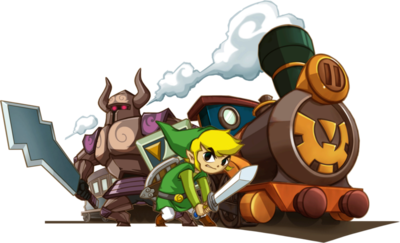 place games after The Wind Waker, Phantom Hourglass and Spirit Tracks timeline arc, I ask you, how do you explain the recession in steam technology, without pinning anything on the developers? an Airbus A380 in Zelda Wii. so. It’s a steam train – get over it!